When it comes to Americans making their way to Southeast Asia, there are often two costs that they consider carefully before making a single reservation. The first is the literal cost of the trip in dollars; and the second, and perhaps an even bigger barrier for some, is the “time cost” that it takes to get there. It’s one thing to pay close to $1,500, but when the total travel time approaches the 24-hour mark (as it does in the case of Malaysia), that can cause some travelers to skip Asia as a travel option altogether. The good news is that Southeast Asia is trying – really trying – to make it easier on tourists who travel long distances by uniting its ten member countries into a single destination. (The tagline “Ten Countries, One Destination” has been officially coined.) From new rail lines to pedestrian bridges to the deregulation of the airline industry, these integrative measures are all part of the ASEAN Tourism Strategic Plan, which aims to significantly increase the number of international visitors to the continent by 2015. Malaysia-Singapore High Speed Rail: Aiming for a 2020 completion date, the proposed railway will run from Penang through Kuala Lumpur to Singapore, traveling at speeds of 280 mph. With stops, the 250-mile trip from Kuala Lumpur to Singapore could be as quick 90 minutes. This is a huge development for many reasons, one of which is that travelers will be able to make easy day trips – as they would in Europe – or even substitute the train for a flight. Deregulation of the Airlines: The Pacific Asia Travel Association recently published a study analyzing how ASEAN members (which include Singapore, Thailand, Vietnam, and Malaysia) have begun to deregulate the airline industry in an attempt to follow in the footsteps of airlines in the U.S. and Europe. For example, in addition to Air Asia, the region’s major budget carrier, other low-cost carriers like Tiger Airways and Lion Air continue to build their routes and establish themselves in this increasingly free marketplace. The moral of the story? As a traveler, you are no longer at the mercy of the national airlines. And given that deregulation seems to only have gotten serious in the past five years, we expect route options in and out of the region will continue to increase, as prices go down. 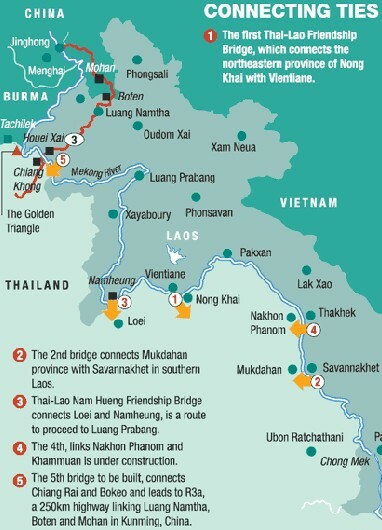 Bridges Connecting Thailand and Laos: While modest when compared to airline deregulation, one can’t overstate the country-connecting possibilities of "friendship" bridges between Thailand and Laos. With them, tourists and locals alike can walk, or ride the bus or train, to cross the border. These bridges have also encouraged tourism, allowing for tour operators to set up easy trips into the neighboring country. The fourth Thai-Laos friendship bridge was completed in 2013, and soon there will be a total of five crossing points where travelers can get visas on arrival. Single-Entry Visa: While there is no timetable for this to come to fruition, its impact on the region would be enormous. The impact on American tourists, in most cases, may not be quite as significant, given that visas are either not required, or are easily available upon arrival in most of the affected countries. But it would certainly save time in Vietnam and Myanmar, which have complex rules for obtaining visas prior to arrival. It would also make jumping between countries much less of a headache.